A new fiddle for Christmas! 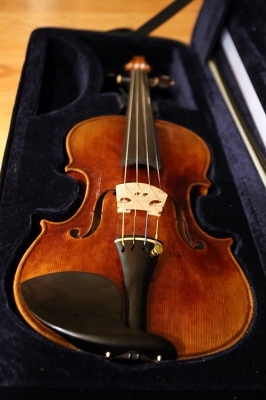 Just had to share...Mr. Scratchy gave me a new, better fiddle for Christmas! It's the Fiddlerman Soloist. Pierre helped him select the right instrument and set it up. 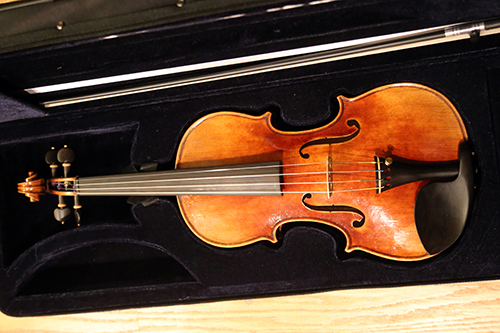 I thought my old violin sounded good, but I can't believe how much better the Soloist sounds. It has a beautiful ring when I hit a note right, which I think will help me improve my playing through positive feedback. Congrat's, Di. I'm sure you're really happy. You did have a, Merry Christmas. Seriously AWESOME gift, KindaScratchy !!!! I can't wait to hear you play it ! I am so excited for you violin. It is extra pretty too so that is really nice. Can't wait to her the violin sing... Your hubby hits the holidays.. Valentine's day and Christmas.... woot woot. Yup, that's really me. When I first signed up for the forum I chose ValentineViolin as a user name because my husband gave me my first violin as a Valentine's Day gift. But before I posted my first post I decided that I didn't like that name and changed it to KindaScratchy. As it turns out, you can change the name that people see but you can't change the actual user name, so I'm kinda stuck with ValentineViolin. When you try to tag someone using the public name, the system switches it to the actual user name. Question, what camera do you use? Excellent job, Di. Timing was great. I don't know why but your "Soloist" sounded richer / darker to me in Ashokan. Thanks, @Bunkei . It's the Canon Vixia HF R40, a small HD video camera. If anyone is interested, I simultaneously recorded the video (with sound through the internal camera mic) and audio with Adobe Audition on my computer through a USB interface with two mics...a pick-up on my fiddle and a hand-held mic on a stand...for stereo sound. On Ashokan Farewell, I mixed the recorded audio with the backing track in Adobe Audition, exported it to MP3 and imported that to my video in Adobe Premiere. On Red Wing, I thought the audio recorded by the video camera sounded better, so I used that and laid the backing track over it in Premiere. Thanks, Ken. I agree. I notice a richer sound on the G and D strings on the Soloist. Ashokan Farewell uses all the strings, so that comes through. Red Wing stays mostly on the A and E strings with a few notes on the D string. Great gift! I'm officially adding Ashokan to my learning list. I really love your use of the backing tracks, they sound great! Grat's on new fiddle and well played. Thanks so much for all the nice comments, everyone. @Just4Fun : I'm definitely hooked on backing tracks now. They help me so much with rhythm and intonation. They're the next best thing to playing with other people. 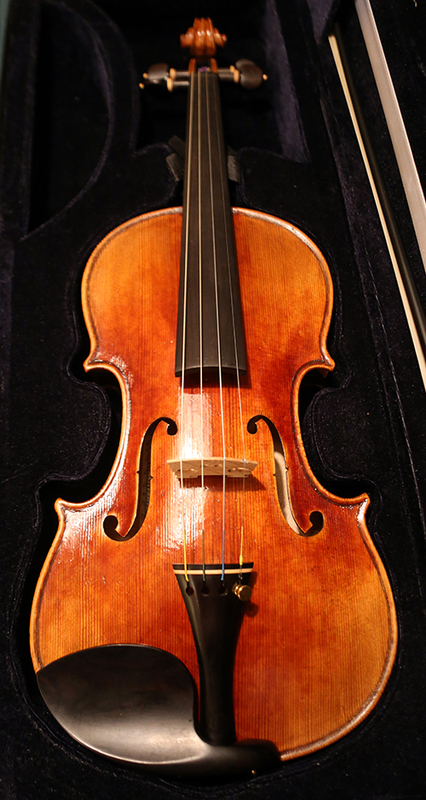 On a humorous side note, since I got my new fiddle, I've noticed my nose runs every time I play it. I suspect it might be from rosin dust flying off the new bow hair. Anyway, I just noticed that at 1:56 in the Ashokan Farewell video, it made me sniff. It's cracking me up because I look really funny. Beautiful new violin friend! And great playing, I enjoyed watching your videos . Where do you get the backing tracks, if I may ask? Something I'm considering using, since my rhythm is awful. 1. The Old Time Jam Machine: The site has backing tracks for 100 or so old time tunes, including different combinations of guitar, banjo and fiddle, as well as slow guitar-only tracks. You can play any of the tracks directly on the site, or if you buy a lifetime membership for $37, you can download all of the tracks. 2. Free Bluegrass Backing Tracks site: this site has backing tracks for a bunch of common bluegrass songs and tunes, as well as chord progressions in various keys. All tracks can be downloaded for free. The site also offers a "slow-downer" which you can use to slow down your own sound files. 3. The Flatpick Apprentice: offers guitar backing tracks for a bunch of bluegrass tunes in various tempos. Tracks can be played directly on the site or downloaded in .zip files. 4. Homemade: I play guitar and have made several of my own backing tracks for tunes that I couldn't find elsewhere. There may be more sources out there for other genres. I believe that it's possible to make backing tracks with software like Band in a Box (I think that may be how the FBBTS tracks were made). For the record, I used the Old Time Jam Machine for Red Wing and Free Bluegrass Backing Tracks for Ashokan Farewell.